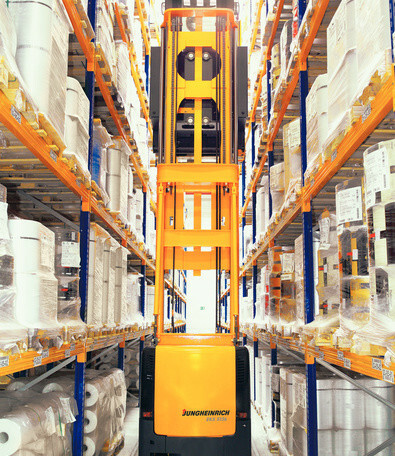 The Jungheinrich EKX 513-515 is best used for narrow aisle warehouse applications, these forklifts set new standards with regard to flexibility, low cost of operation and ergonomics. Offering versatility through modular construction, the EXK series of turret trucks have over 5 million possible configurations providing adaptability to any warehousing and logistics operation. Intelligent lift truck management with our proprietary electronic controller and CAN-Bus system keeps the options open for a wide range of requirements to precisely match the forklift truck to the application. There are a variety of optional packages and systems available, including RFID ground control and the Jungheinrich®warehouse navigation system. The KX 513-515 man-up turret truck is available with optional transponder technology and warehouse navigation, which allows for maximum levels of productivity and security as lift truck performance can be tailored to the specific conditions of multiple areas within the warehouse. Hydraulic pump motors only run at speed required to complete requested action so no energy is wasted. Powerful, efficient forklift motors run cooler for even greater efficiency. 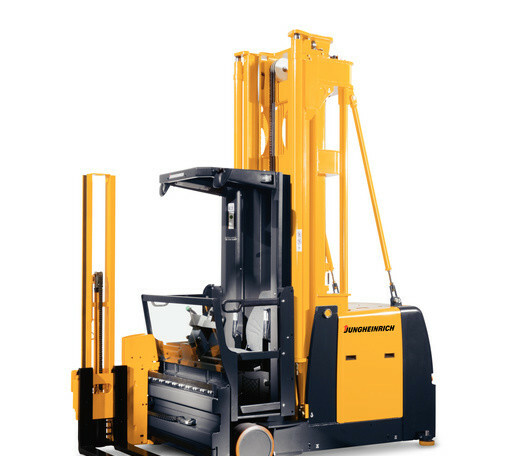 Seamless operation of all lift truck functions together. Optionally available, factory installed and integrated into the lift truck’s electronic control system/CAN-Bus. 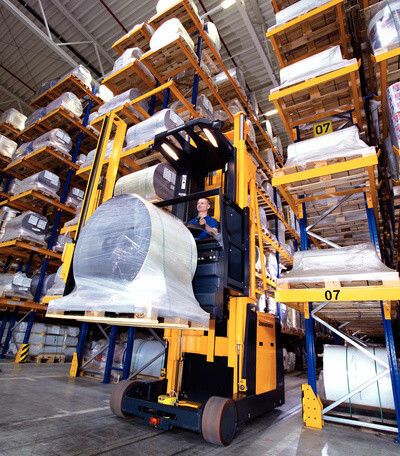 Senses presence of pedestrians in working aisle and alerts operator; slows and/or stops the forklift as necessary. Generously dimensioned entrance into the lift truck's operator cab. Large footwells and adjustable knee supports make room for a wide variety of operator sizes. Excellent visibility towards the load with low mounted turret and clear view masts. The seat is spring cushioned, adjustable and foldable to ensure full-shift comfort. Electrically adjustable operating console with color display. Soft-key pad (softkey) with number block. 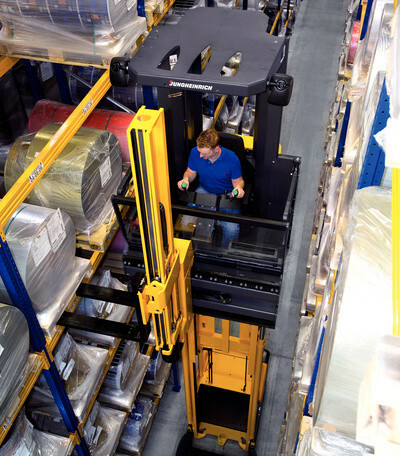 Lift truck performance can be set for each specific operator or can be selected by the operator to suit the needs of the load. Switchless, two-handed operating concept for reliability. All hydraulic functions have end of travel dampening for smooth operation and maximum load stability. Electronically controlled drive-wheel brake and electromagnetic, laminated, wear-free brake on load wheels. Active or passive stabilizers for maximum capacities to high lift heights (optional). 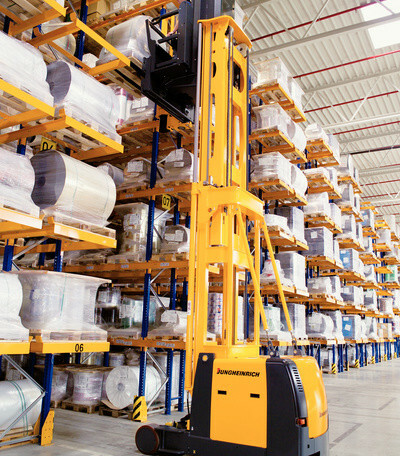 “Teach-in” process during installation “teaches” the forklift truck the exact configuration of the warehouse for maximum utilization. Integrated diagnostic system for remote maintenance via modem. Up to 1000 operating hour service intervals. Electronics with wear-free sensor system. Sealed drive unit with lifetime rated gear oil. Revolution counter on wheels with traction control and wear recognition on drive wheel. Robust and wear-free 3-phase AC motors require no down-time for maintenance. Inductive (wire) guidance for precise control in the aisle with no mechanical wear of components. Modular telescopic forks for multiple pallet dimensions. Comfort package “workplace” with workplace lighting, mirror and fans. Mechanical and electrical support for warehouse material flow management systems. Lift truck preparation for working platforms. 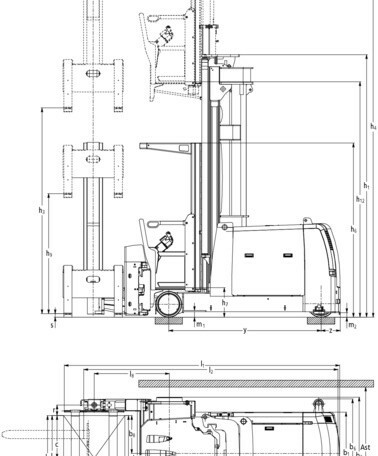 Modular system for lift and travel stop as well as lift truck speed reduction.